It’s no wonder Millennials draw so much attention in the media. They’re the fastest-growing group of consumers, and many marketers find their interests strange and arcane. They’re solidly within the much-coveted 18-to-35 demographic marketers seek, making them fresh young tastemakers. But Millennials aren’t the only group with outsized purchasing power. Baby Boomers still make up the largest segment of the American population. Though many Boomers are now seniors, their societal influence hasn’t diminished, and they still have plenty of financial muscle to flex. It’s not just enough to cater to the needs of the young. Everybody, from bars to restaurants to senior living facilities, needs to know: what are Boomers’ unique tastes? Have they changed over time, or are they essentially the same as they were years ago? How can businesses and care facilities meet Boomers’ needs? Many seniors opt for tap or bottled water as a healthy choice. You may think of carbonated and flavored waters as Millennial trends, and the evidence bears that out – but keep in mind that everybody enjoys flavor, texture, and variety. Especially for seniors who are working hard to meet their doctors’ recommendations about water intake, novel takes on ordinary water can help them meet their hydration goals. Some residents at facilities may need encouragement to try something new. (This isn’t unique to Boomers, of course. Anyone and everyone can get set in their habits.) But when seniors find a water drink they like, they may fall in love with it. Researchers have shown that nearly all Americans, regardless of age, like hot beverages in cold weather. During warmer months, iced versions of hot beverages become more popular, but even then hot beverages maintain a remarkable portion of the market share. The hot drink of choice in the U.S. remains coffee. But especially in older populations, researchers are seeing tea growing in prominence, perhaps as a healthy alternative. Green, black, oolong, and herbal teas are all well-loved for their health effects, and their ability to help people focus without feeling jittery. For those who are still drinking coffee – which is most everyone – there’s been a swing toward luxurious coffee drinks. These are the sorts of things it takes a barista to create, instead of plain old coffee with cream. In general, Boomers are less likely to hop on this bandwagon than Millennials have been; they may see pricey coffee drinks as a waste of time or money, or loaded with too much sugar. But that’s not to say Boomers aren’t interested in flavor, variety, or novelty. 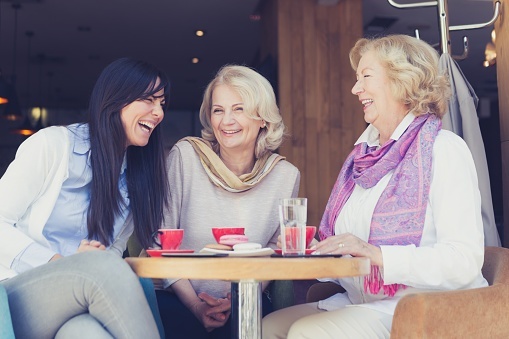 For seniors looking to dress up their coffee at a senior living facility, creative options for flavoring can go a long way toward breaking up their normal drink routine, without breaking the bank or requiring a facility to hire a barista. Many people think of soft drinks as being for the young. While this isn’t inaccurate, you could make a strong case that this bit of cultural knowledge is based in Boomers’ childhoods, when many soft drinks rose to new prominence. People across all demographics drink sodas, and Boomers are no exception. They’re likely to seek out the same drinks that became familiar to them in their childhood. However, there’s room to experiment: because of health concerns, Boomers may drink soft drinks in smaller amounts than they did before. This can naturally lead them to quality over quantity, so they may discover new sodas that way. Many Boomers may avoid caffeine, so you should make sure you have caffeine-free options available. All soft drinks are sweetened, but sugar, high fructose corn syrup, or artificial sweeteners may be at the top of residents’ lists to avoid, causing them to seek out other sweeteners. Because of this, it’s wise to give seniors a variety of options. Milks, fruit juices, and vegetable juices are favorites among many seniors, on the grounds that they’re healthy. Many milks and juices come fortified with extra vitamins and minerals, for additional health value. If a senior is already seeking out these health-conscious options, they may not need the encouragement that comes with extra nutrients. But providing them with the option – especially if the beverage doesn’t make up for it with flavoring or sugar – shows residents you’re invested in their health. Boomers were once marketers’ darlings, but they’ve since ceded the stage to Gen X and Millennials, in turn. Despite this, they still have a ton of purchasing power. And as they’re entering senior living facilities, managers and staff need to sit up and take notice of seniors’ beverage needs. While Boomers’ tastes have changed, they still make sense, given trends of yesteryear. They will seek coffee and soft drinks, for instance, although their preferences may change due to health concerns or broader market trends. By carefully considering seniors’ tastes, facilities can meet their residents’ needs in ways that will make them happy for years to come.